Just a little reminder that the next FAL weekend is next weekend, 6-8 April, so start dragging thost FUFO’s out in readiness … I don’t know about you, but I have plenty to choose from! 😉 Look forward to seeing you there, and seeing all your lovely finishes. Thank you very much Karen for an excellent tutorial. I didn’t have any trouble following your instructions and your photos were very clear. I had a lot of fun making this little pillow and will be using this technique again. 🙂 The design is a freebie from Stitchy Kitty. Hi ladies. 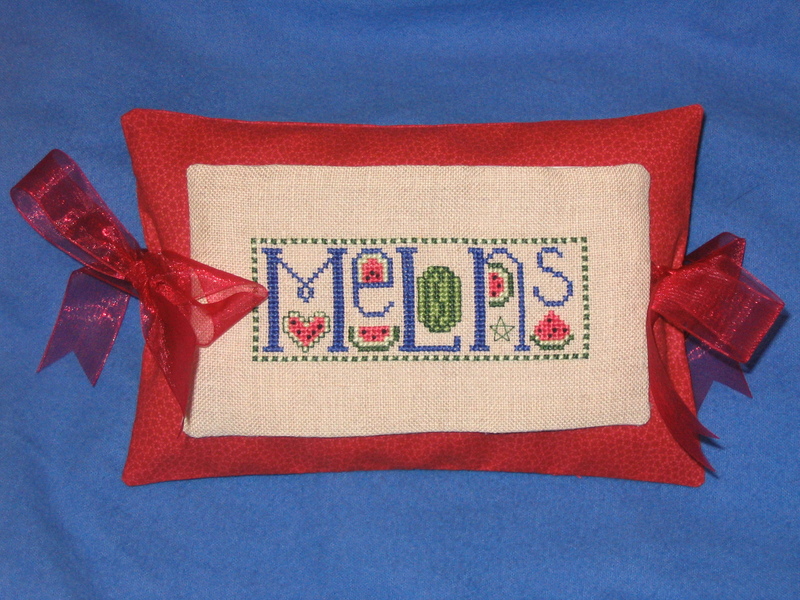 I managed to stitch this project this morning with Karen’s excellent tutorial! I was afraid there would be buttonholes or something complicated. My sampler is an old Ewe & Eye pattern. The pillow measures about 11 x 6 inches. It will be fun getting all these unfinished items transformed into projects like this one. Thanks again Karen, I’m glad I found this blog. This was a great class on tie-on pillows! I had no trouble at all in making my first of what I’m sure are many. I used my Flea Market Souvenir from Blackbird Designs to make mine. I’m making a quilt so I used matching fabric so I can put this on my bed when the quilt is finished. I was really looking forward to Karen’s tie-on pillow class this morning. And as promised the instructions were up. Just a quick final reminder that the tie-on pillow class is this weekend, 24 and 25th March! The class instructions are all ready to go; in order to give ladies “down under” a chance to join in properly, I shall be posting them late in the evening (around 10.30pm UK time) on Friday. However, I won’t be available to answer questions (if needed) until at least 8am on Saturday morning (our time) 😉 Hopefully the instructions will be so clear that you won’t need to ask any questions 🙂 but I thought I’d mention it, just in case. I hope that many of you will join in with the class and share your photos and comments afterwards 🙂 Remember you need a WP account to post to the blog, so if you don’t have one, don’t forget to set it up now and email me so that I can add you as an author.